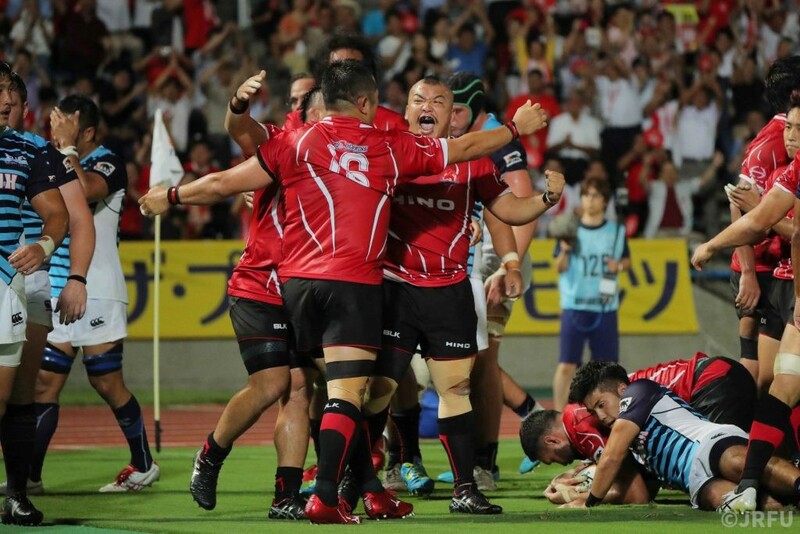 TOKYO (Aug. 31) – Hino Red Dolphins celebrated their first ever game in the Japan Rugby Top League in style Friday as they beat Munakata Sanx Blues 33-3. Flanker Ash Parker put in a man-of-the match performance as the Red Dolphins crossed the chalk three times at Machida Athletic Stadium. Parker grabbed a brace of five-pointers and Norifumi Hashimoto crossed once for the new boys with Shigenori Someyama weighing in with three penalty goals and three conversions and Hayden Cripps kicking one penalty. At Prince Chichibu Memorial Rugby Ground, Canon Eagles beat Toshiba Brave Lupus for the first time ever in the league. New Canon coach Allister Coetzee said the 26-20 victory was a team performance but admitted the Japan international trio of Yu Tamura, Yusuke Niwai and Samuela Anise had risen to the occasion. Tamura kicked 11 points including the go-ahead drop goal in the 68th minute, Anise’ powerful running helped Naoto Shimada score the first try of the season, while Niwai’s charge down of a Mike Harris drop goal attempt eventually saw Aiban Mishima score the decisive try five minutes from time. Last year’s runners-up Panasonic Wild Knights were made to work very hard for their 15-11 win over Kubota Spears at Osaka’s Kincho Stadium. Tries by Akihito Yamada and Keisuke Uchida and a conversion and penalty from Takuya Yamasawa saw Panasonic lead 15-5 at the break – Yuji Ito crossing for Kubota. There were just six points in the second half – two penalties from Kazuhiro Goya – as the Spears almost caused an upset. In the final game of the opening day, Kobe Kobelco Steelers downed NTT Communications Shining Arcs 34-27. Four conversions and two penalty goals from the left boot of Hayden Parker eventually saw Kobe home, though Garth April’s conversion of Shane Gates’ try in the 74th minute ensured a thrilling finish at Kobe’s Universiade Memorial Stadium. The opening weekend continues Saturday with a further four games.